Chocolate shavings and curls are a pretty way to top off almost any dessert. I recently recommended them as one of my 5 Fast Ways to Finish a Tart. They also happen to be very easy to make because you only need a bar of chocolate and a vegetable peeler to make them! Start with a bar of chocolate that is no wider than your peeler. I often turn a bar of chocolate on its side, since that gives me a little more area to hold on to. 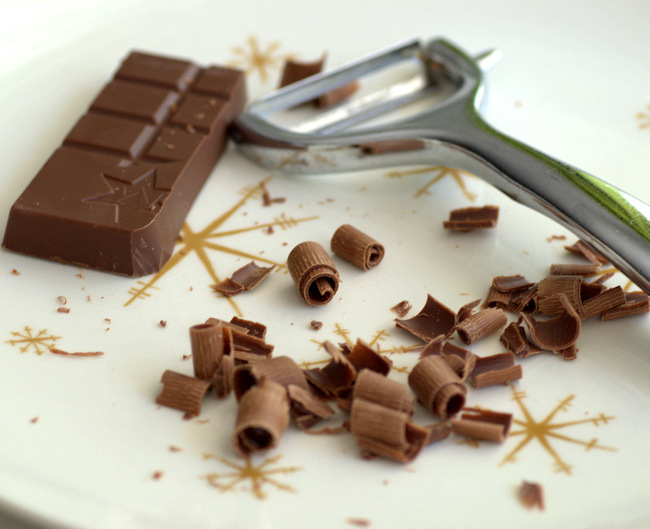 To make shavings, run the peeler down the side of the chocolate bar in short, sharp strokes. This will create nice, well-defined shavings. To form a curl, run the peeler firmly and smoothly all the way down the side of the chocolate. If this is your first time trying to curl chocolate, you’ll probably end up producing chocolate shavings (still yummy) instead of curls, as it takes some practice to get the pressure just right. But after a few tries, you should be able to produce curls down the whole length of the chocolate bar! You can use a knife to produce shavings, but it is quicker and the pieces will be more consistent if you opt for the peeler. Any chocolate can be used to make chocolate shavings. Chocolates that are a bit softer and contain more milk, sugar and cocoa butter – such as milk chocolate or white chocolate – tend to be easier to make curls out of than dark chocolate. Dark chocolate bars are simply a bit more brittle and more likely to break into chocolate shards if your hand slips on the peeler. Shape your curls over a cutting board or plate so that you can gently slide them off onto any cakes, cupcakes or ice cream sundaes you want to finish off with them. They can also be stored (gently) in an airtight container if you want to keep them on hand for future use. For super size chocolate curls, chocolatiers and pastry chefs will use a very large bar of chocolate, or a very thin layer of tempered chocolate spread out on a flat work surface, and a bench scraper. The bench scraper does the same job as the vegetable peeler, but it can cover a larger area. This technique takes a little more finesse because it is harder to get even pressure on the scraper, but it is well worth trying if you want some truly impressive chocolate curls.